The rules of Go (Baduk in Korea, WeiQi in China, or Igo in Japan) are simple. There’s only one type of piece (black and white “stones”), there’s only one type of move. You place that piece on the board and then your goal is to create linked groups of your stones that surround some empty territory. When you surround enemy stones, you capture them and remove them from the board. You earn points by surrounding territory and at the end of the game, the person with the most territory wins. It seems really simple, but then when you sit down to play you realise right away that while technically you know you’re allowed to do, you have no clue what it is you should do! 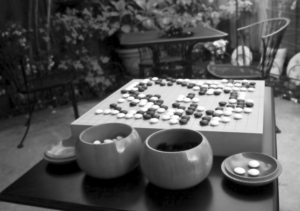 Go is the world’s oldest continuously played board game, dating back nearly 4000 years. In some sense, it one of the simplest and yet one of the most abstract, requiring not only analytical skills but also loads of creativity. Because of it being played on an 8×8 board (64) squares, a typical chess position has 20-30 legal moves at any given time, of which 3-4 or so could be considered ‘candidate moves’, i.e. moves that strong players would play. Go, on the other hand, played on a 19×19 board or 361 intersections (more than 5 and a half chessboards), has 200-300 legal moves, of which 20-30 could be considered as candidate moves. A normal game of chess lasts about 40 moves, while a typical tightly contested game of Go could last 300 moves or more. Chess is a battle, but Go is WAR!! !